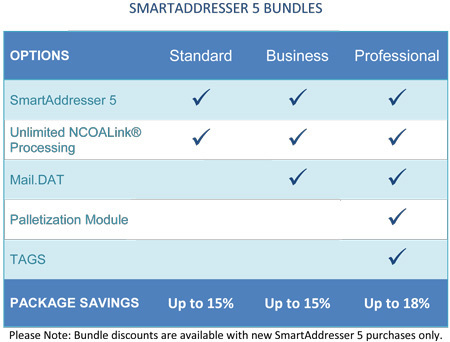 SmartAddresser 5 Bundles are a great way to purchase the add-ons you need at a discounted rate. We have put together three bundles of add-ons based on the most common requirements of our customers. These three bundles are as follows: Standard, Business and Professional. Along with the core SmartAddresser 5 software, the following options are available within these bundles. 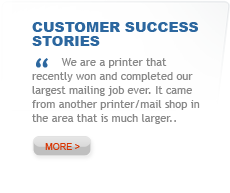 Unlimited NCOALink Processing – keep track of your customers as they move. Mail.dat – Eliminate the postal paper chase. Palletization Module – a must-have option for the higher volume mailer. Tags Module – Print and save your mailing tags. PLUS – We also have multi-year packages available for you too. Purchase additional years of updates in advance and save even more money. Take a look below to see what the best options for you are and tell your sales manager that you want to save even more by purchasing a SmartAddresser 5 Bundle, or a Multi-Year Package. Contact Us Today for more information!